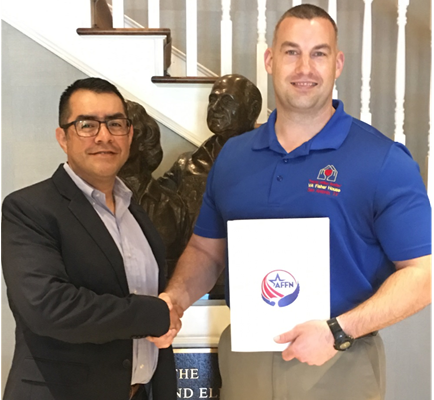 SAN ANTONIO, TX (April 4, 2018) — The Armed Forces Financial Network (AFFN), along with on-base financial institutions on JBSA-Lackland, presented 80 “Thank You” gift cards valued at $50 each to the JBSA-Lackland Fisher House and the South Texas VA Fisher House. The cards are intended to be distributed to military personnel and their families staying at the houses as they receive treatment at a local hospital. These annual gift cards presented by AFFN are a small “Thank You” for the service and sacrifice made by the men and women in our military and their families. AFFN, in partnership with the Defense Credit Union Council (DCUC) and the Association of Military Banks of America (AMBA), has proudly supported the Fisher House Foundation and individual Fisher Houses in Germany and the United States for the last 14 years through the community support program. It has provided over $3,297,800.00 in direct support during that period. Every dollar distributed has assisted military service members, veterans and their families for care, comfort, and food while staying at a Fisher House. Air Force Federal Credit Union (AFFCU) representatives made the presentation of the gift cards, which totaled $4,000.00, to Dwayne Hopkins (JBSA-Lackland Fisher House Executive Director) and Erik Zielinski (Manager South Texas VA Fisher House) on behalf of the financial institutions on JBSA-Lackland AFB. The “Thank You” cards can be used at any of the 1.3 million locations worldwide accepting AFFN payments including Defense Commissary Agency (DeCA) and Army and Air Force Exchange Service (AAFES). The cards function the same as Debit or ATM cards, and will be distributed to military personnel by Fisher House management. Since 2005, 16,080 military families staying at Fisher Houses worldwide have received $804,000.00 in DeCA Certichecks (2005, 2006) and AFFN Thank You Cards (2007-2018) from AFFN military community support programs. Dwayne Hopkins, Executive Director Fisher House, Danny Sanchez, VP Marketing, AFFCU and Brian Posten, Business Development Officer, AFFCU. 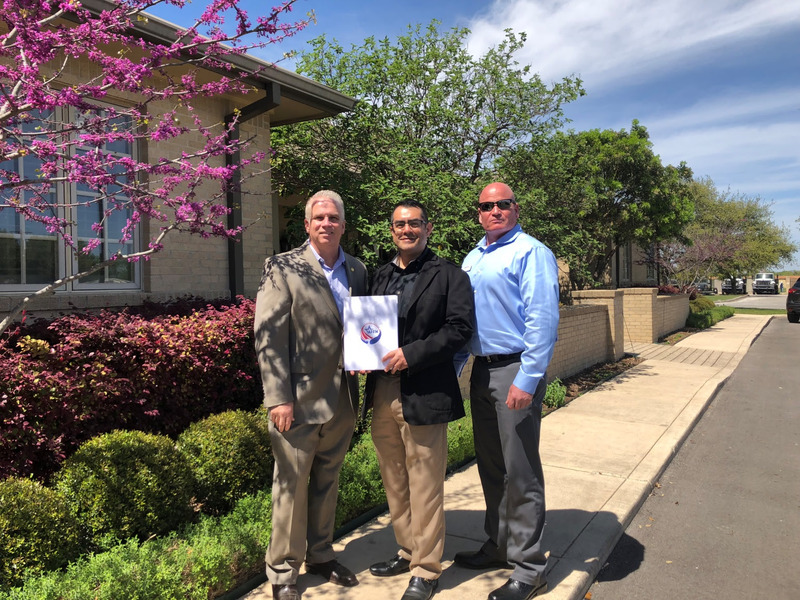 Danny Sanchez, VP Marketing, AFFCU and Erik Zeilinski, Manager South Texas VA Fisher House. AFFCU serves the diverse needs of over 43,000 members worldwide with a full array of financial services and the strength of more than $401 million in assets. For additional details about AFFCU, visit www.airforcefcu.com. Fisher House is a public-private partnership with the military that provides families living quarters and support when coping with specialized medical situations. The JBSA-Lackland Fisher House is a home-away-from-home for the families of seriously ill or injured patients receiving treatment at Wilford Hall Ambulatory Surgical Center. For more details, visit www.fisherhouseinc.org. The South Texas VA Fisher House provides a “home away from home” for military families of who’s loved ones are receiving treatment at the South Texas Veterans Health Care System (STVHCS). STVHCS is comprised of two inpatient campuses: the Audie L. Murphy Memorial Veterans Hospital in San Antonio and the Kerrville VA Hospital in Kerrville, Texas. In addition to the two major facilities, STVHCS operates several outpatient clinics in Victoria, Texas and throughout the San Antonio area which serves 96,000 unique patients. The STVCHS is also the home of one of five Level 1 Polytrauma Rehabilitation Centers that provides state of the art rehabilitation care to veterans and service members with multiple traumatic injuries. AFFN is an Electronic Funds Transfer (EFT) Network founded in 1985, co-owned by DCUC and AMBA, servicing over 357 defense credit unions and military banks, 93 million cardholders, at over 800,000 ATMs and over 2.3 million merchant/retail locations globally. To learn more about AFFN, please visit www.affn.org.